Viking Aronia Berry (aronia melanocarpa "viking") Also known as black chokeberry, Perennial deciduous shrub produces dark black edible berries that the birds simply adore. Hailed as a superfood due to the high antioxident content found in the berries, bush produces white flowers in the Spring and dark black (blue-berry sized) fruits in Autumn. Raw berries are tart, bitter, and very astringent similar to a persimmon and are most commonly used in sauces, jams, jellies, pies and juices. Shrub can grow 3' - 6' tall and wide. Leaves provide beautiful purple/red Autumn color. 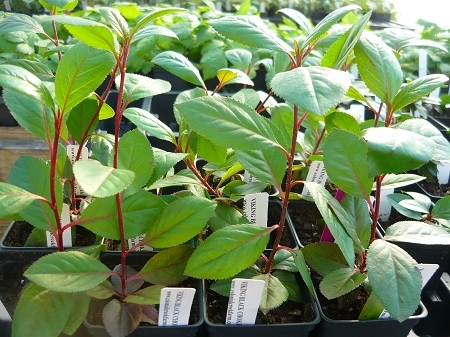 Easy to grow in full sun or part shade. Perennial zones 3-8. One live starter plant in 3" container.